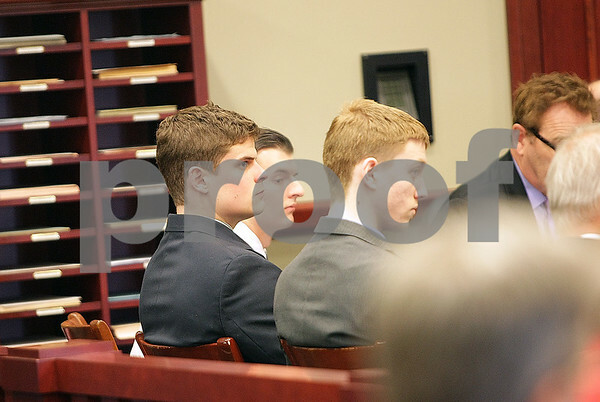 As seated, Alex Jandick (far left), James Harvey (center), and Patrick Merrill (right), listen to DeKalb County Judge John McAdams during a hearing on April 24, 2014. Jandick, Harvey, and Merrill with their attorneys went before DeKalb County Judge John McAdams arguing the Illinois Hazing Law is vague and therefore unconstitutional. The men were are officers in the Pi Kappa Alpha fraternity on the campus of Northern Illinois University where alcohol was a contributing factor in the death of pledge David Bogenberger, who's body was found on Nov. 2, 2012 in the fraternity's house.